Cabo Wabo Cantina, located inside Miracle Mile Shops at Planet Hollywood Resort & Casino in Las Vegas, will honor the United States armed forces throughout the month of May for Military Appreciation Month with a patriotic cocktail, charity donations and a military discount. Cabo Wabo will serve the All-American cocktail, a red, white and blue layered libation, made with a vibrant blend of Absolut Citron, simple syrup, sweet and sour, Sprite, grenadine and blue curacao, priced at $13. For every All-American cocktail sold, Cabo Wabo will donate a portion of the proceeds to the Wounded Warrior Project, a nonprofit organization that aids support to wounded veterans. 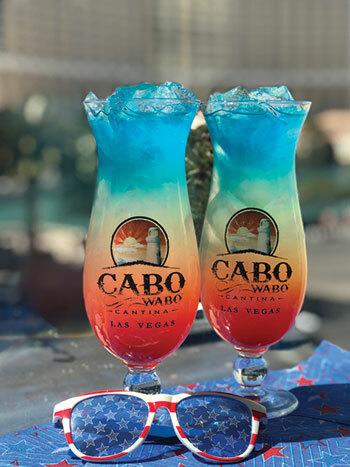 Cabo Wabo will also honor active military and veterans by offering a 20 percent discount on all food and drink purchases, when a valid military ID is presented. Cabo Wabo offers a diverse menu of coastal Mexican and Tex Mex dishes, plus an expansive list of tequilas, margaritas and signature cocktails.